I grew up in a house of girls....a family of five, with my dad being the only male. Barbies, makeup, sparkles and fashion...these were the things I knew. Dirt, cars and gross little animals? Not on my radar...I didn't know a thing about boys! So, when I found out my first child was going to be a boy, I was a little uncertain on how I was going to learn to raise a BOY! How different would it be? What would I need to know? How was I going to deal with a kid who loved cars and building things and dirt more than dolls and dress up? Some things came pretty naturally, and others I have learned as I've gone...but after 7.5 years of being a mom to a boy, I still find myself with questions. Thankfully, there are many great books on the subject. Among this is The Savvy Mom's Guide to Raising Boys! First off, I have to say that while I know they say you shouldn't judge a book by its cover...I must admit I do so anyway! And this one drew me right in...it was just my style! Fun, bright, pretty! Would the contents live up to the cover? So far, the answer is YES! Now, admittedly, I have not read the book all the way through until the end...because frankly, I don't need to just yet! 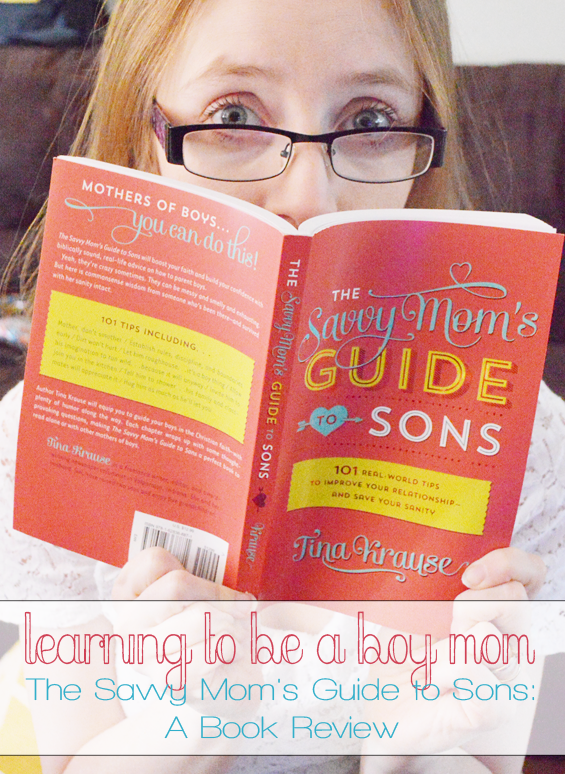 The book features 101 tips to help moms deal with the fun and excitement of raising a boy. And to make it easy, the tips are in order of age! It starts at the newborn stage, and continues on throughout elementary school, puberty and yes, even those teenage/ready to leave the nest! The tips provided are both fun and practical...things like cover him with a wipe during diaper changes or not to worry so much about messes and dirt. The Style. No, I'm not just talking about the style of the cover as I'd already mentioned, but rather the style of the writing. It was humorous, but practical...just the type of attitude one must have while parenting a boy! I felt like I was having a conversation with a girlfriend, or even in some cases found that the words were words I could have/would have written myself. The Layout. The chapters were short, to the point and easy to read...and most importantly I could skip around as I pleased! I actually did start reading at the beginning- though my son is well past the baby stage, I wanted to get a good feel of the book before jumping into the sections more suitable for his age group. I like that I could easily navigate to where I needed to be and didn't have to read through more content than necessary! I also love that this is a book that will grow with my son as he grows! The Scripture. My absolute favorite part of the book was the scriptural references. As Christian mothers, we want to do our best to raise our children in a way that is pleasing to God. This book will help us do just that. Each chapter includes a Bible verse and ties in these pieces of advice with Biblical references. It also includes great tips like talking to your son about Jesus and teaching him to pray. This is not just a guide to raising boys...but a guide for raising Godly boys! If you have a little boy, this is certainly a fun read and a great addition to your parenting book collection. It also makes a great gift for the mom of boys (make it a gift bag with a mug and some coffee- believe me, she'll need it!). You can purchase this and many more great parenting selections at Family Christian. It is regularly only $12.99...but from February 17-26, you can get it half off! What a deal! I actually would really like to get this book. I have 5 sons and would love to read it! I would let the girls pick out a book or two. My boys love Veggie Tales - I might get Beauty and the Beet for them.